Prepared by: the Bureau's Foreign Trade Division. "Seasonally adjusted and unadjusted data." 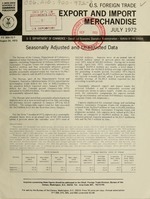 Latest issue consulted: Dec. 1973.
million for exports and $4,495.0 million for imports. the $4.0 billion level for the first time since lanualN. Jui. and $41,06.5 million in June. 'E a i ports o 2.9 -0.2 -3. 4.5 -3. ; .9 .?. Census, Washington, D.C. 20233. Tel: Area Code 301, 763-5140. (FT 900. 975. 985, and 986 combined) $3.00. General imports are a cor inatmion of entries',.for..
the same condition as when imported. are as originally issued, except as noted below. the Bureau of the Census, Washington, D.C. 20233.
date Jor export is considered to be the date of mailing. 1 Represents exports of domestic and foreign merchandise excluding Department of Defense Military Assistance Program Grant-Aid shipments. Delined as exports (see footnote 1, above) minus general imports. 'L-6s 1,r t971 and 1972 reflect seasonal adjustment factors introduced In January 1971. See footnote 1 oan front page. ,r pr-. r. ; exports of domestic and foreign merchandise excluding Department of Defense Military Assistance Program Grant-Aid shipments. [Es, n. .7 exports (see footnote 2, above) minus general imports. Ir c *- r* 1 r ., Ii. I ri rC C n Ir . 'c Ir p;C, . -:r .r I..: I .i -r. r, ,- r ". r -r .[ I e. r r o,- r, i r,.r Ie i re rr..ir..* r rp ir-re; ..re . Grant-Aid Shipments--Schedule B Sections and Selected Divisions. Seasonally Adjusted and Unadjusted, by Month. M: -r h .. ... '5 "9. 401 .. 1' 3 i- -, i .'-. 7-.5 I 1 .' 1 -i,. Jur,. 3- 41 E .? '.' I'' 3 1, .' ... i i- . aNoveirh .... .3.". .n I 6 7 1 14'. 2 1: 4 i .
February r. .? i 4" 1 36_. 7 l 5 i "i' i .
a)p r3 .. .. 7. ..' A I .
p l . .l .iI I "" L l r I r l 7 5 ; . Api r 1 'r i 7 i 3'A' 37., i rl : r : .7 .3 l i, h. ,r H 'i r 3 1 . I. i 'r $ 4,144. 7 7. '' .. i' 'r I. 7 . April................... 522.0 70.4 2-7.3 ?69.3 17.6 15.' 8?3.9 i,9'g.6 436 1 1.3 .1. 3. Mineral fuels, lubricants, and related materiat- *_ 6.:. Il:n. .u- r.sar al [,ur-n ar[ti:l,., r,..e-. this table and similar overall F.r.,l'hl. totals in tabli. i ..-, 3 -Frc al..tc, ,mndr pI.netl. 3In the absence of demonstrable seasonal patterns r tri m.', .., r.- *r..". ;anl aIl utn..wnl fact:r:- thai bfre apple ea .tr dtce.